Roadies TV show season one image courtesy of Showtime. The key is family. Below, watch the official Roadies TV show trailer, from Showtime. 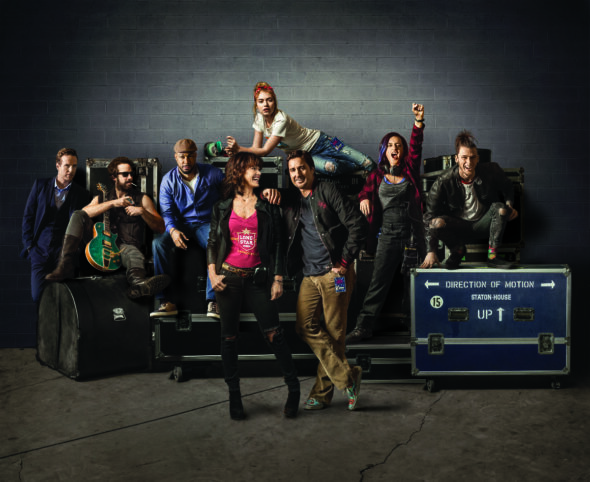 A music business comedy series from Cameron Crowe, Roadies premieres Sunday, June 26, 2016, at 10:00pm ET/PT. The Roadies TV series cast includes: Luke Wilson, Carla Gugino, Imogen Poots, Rafe Spall, Keisha Castle-Hughes, Peter Cambor, Colson Baker a.k.a. Machine Gun Kelly, and Ron White. Luis Guzman, Jacqueline Byers, Finesse Mitchell, Branscombe Richmond, and Tanc Sade guest star. Get more information and watch the new trailer, from Showtime. NEW YORK – May 26, 2016 – SHOWTIME has debuted the new trailer for its highly-anticipated comedy ROADIES, the first original series from creator, executive producer, writer and director Cameron Crowe. With an ensemble cast headed by Luke Wilson (Old School, Enlightened) and Screen Actors Guild Award nominee Carla Gugino (San Andreas), the one-hour music series will premiere on Sunday, June 26th at 10 p.m. ET/PT on air, on demand and over the internet. ROADIES gives an insider’s look at the reckless, romantic, funny and often poignant lives of a committed group of roadies who live for music and the de facto family they’ve formed along the way. The series chronicles the rock world through the eyes of music’s unsung heroes and pays homage to the backstage workers who put the show on the road while touring for the successful arena-level group, The Staton-House Band. The ensemble cast of ROADIES also includes series stars Imogen Poots (The Look of Love), Rafe Spall (One Day), Academy Award® nominee Keisha Castle-Hughes (Whale Rider), Peter Cambor (NCIS: Los Angeles), Colson Baker a.k.a. Machine Gun Kelly (Beyond the Lights) and Ron White (Blue Collar Comedy Tour). Luis Guzmán (Code Black), Jacqueline Byers (The Strain), Finesse Mitchell (Saturday Night Live), Branscombe Richmond (Forgetting Sarah Marshall) and Tanc Sade (Matador, Gilmore Girls) guest star. ROADIES is currently in production on ten episodes in Los Angeles. Emmy® and Tony® Award nominee Winnie Holzman (My So-Called Life, Wicked) serves as writer and executive producer, along with Emmy winners J.J. Abrams (Star Wars: Episode VII – The Force Awakens, Lost), Bryan Burk (Lost, Fringe, Person of Interest) and Len Goldstein (Hart of Dixie). Kathy Lingg (Person of Interest, Fringe) is co-executive producer. Kelly Curtis, Pearl Jam’s manager and a regular collaborator with Crowe, serves as producer. ROADIES is produced by Bad Robot Productions, Vinyl Films and Dooley & Company Productions, in association with Warner Bros. Television. For more information about ROADIES, follow on Twitter, Instagram and Facebook, and join the conversation using #SHORoadies. What do you think? How do you like the sound of the Roadies TV show? Do you plan to watch the Roadies TV series premiere on Showtime? More about: Roadies, Roadies: canceled or renewed?, Showtime TV shows: canceled or renewed?